U.S. combat mission in Afghanistan ends: Is America's longest war really over? 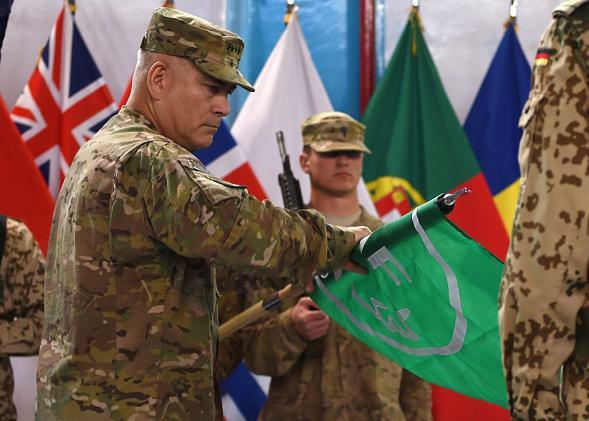 Gen. John Campbell rolls up the flag of the International Security Assistance Force during a ceremony marking the end of the NATO combat mission in Afghanistan on Dec. 28, 2014. Americans have been trained not to expect triumphant treaty signings on the decks of aircraft carriers or ticker-tape parades at the end of wars anymore. But even by the diminished standards of 21st-century warfare, the conclusion of combat operations in Afghanistan on Sunday feels awfully anticlimactic. For one thing, while the president may have assured the public Sunday that “the longest war in American history is coming to a responsible conclusion,” that verdict comes with considerable caveats. About 13,500 international troops, 9,800 of them Americans, will remain in the country thanks to a deal reached with Afghanistan’s new government in September. These troops will serve in non-combat roles, including training Afghan security forces and assisting in counterterrorism missions. A full pullout isn’t scheduled until the end of 2016. That potential is very real in Afghanistan, where recent weeks have seen a growing number of increasingly brazen Taliban attacks near Kabul, many of them targeting foreigners. Two American soldiers were killed just two weeks ago when a NATO convoy was bombed in eastern Afghanistan. An American general was killed in an attack on a U.S. base in August, the first time that has happened since the Vietnam War. He was shot by an Afghan soldier while making a routine visit to a military academy, one of a number of recent “insider” attacks against U.S. trainers. It’s also not entirely clear that American soldiers are finished with more traditional combat. While Americans won’t be going out on regular patrols, a White House order issued in November authorized them to carry out attacks on the Taliban in response to threats against the U.S. military or Afghan government. Recent events in Iraq, where the U.S. is once again carrying out airstrikes, are also an indication that the U.S. could still return to a more obvious combat role if the situation gets out of hand and local security forces turn out not to be up to the task. The Pentagon’s own recent assessments of the preparedness of these forces aren’t exactly reassuring. As I discussed in a recent article, the 2001 Authorization for the Use of Military Force Against Terrorists, the legal basis for the war in Afghanistan, is still in effect and Congress doesn’t appear to be in much hurry to rescind it or put limits on where or when the president can attack terrorists. It’s not that hard to imagine a scenario in which American firepower is once again committed to fighting the Taliban in defense of a beleaguered Afghan government. Given the precedents of Syria and Iraq, it’s hard to imagine this aid taking the form of ground troops under the Obama administration, but who’s to say what approach his successor may take? The only people who seem particularly enthused by this week’s milestone are the Taliban, who today issued a statement proclaiming the “defeat” of the U.S. and its allies, saying, “ISAF rolled up its flag in an atmosphere of failure and disappointment without having achieved anything substantial or tangible.” Neither they, nor the American public, should be so sure that America’s longest war is really over.